STMicroelectronics provides an extensive software library for the STR75 device series. The library is ported to MDK-ARM and the RealView Compiler, and is available in the folder ...\ARM\RV31\LIB\ST. The STR75 Software Library is a software collection for the STR75 peripherals. The library contains a set of functions for each peripheral. STMicroelectronics provides detailed documentation in the STR75x Software Library Users Manual which is available after installation on the µVision Project Workspace — Books tab. STR75x.LIB: fast and efficient interrupt function handling (Keil-Style). This is the preferred library when starting new projects. STR75xD.LIB: (Debug Version) STMicroelectronics specific interrupt handling and debug variables for peripherals. Because the Keil µVision Debugger provides detailed outputs for all on-chip peripherals, this library is not required when you are using the Keil µVision Debugger. STR75xR.LIB: (Release Version) STMicroelectronics specific interrupt handling without debug variables. If you use this library for different hardware, you may need to change the settings in the 75x_conf.h file and re-build the library using the µVision project. 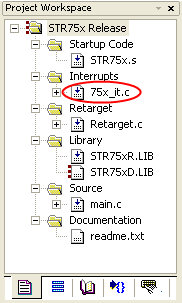 If you use any STMicroelectronics library functions, be sure to include the header file, 75x_lib.H, since it contains the definitions for the STR75x Software Library functions and macros. When using the STMicroelectronics specific interrupt handling (STR75xD.LIB or STR75xR.LIB), add a copy of the source file ...\ARM\EXAMPLES\ST\STR75xLIB\EIC\75x_it.c to your project folder. This file contains all interrupt functions. It is strongly recommended that you copy this file to your project folder.